A door hinge pin removing tool borrowed from the tool crib of the Twin Cities Model A Ford club (I am a member) is used to drive out the hinge pins. In removing the paint from a previous restoration I discovered that the restorer had Bondoed over five bullet holes in the passenger side door. I have not reported the gunshot holes to the sheriff. This is the stand I made to support the front fenders while they were being repaired and refinished. The fender mount can be turned over to make repairs and refinish the bottom side of the fenders. The edge of one front fender was bent out and kinked. A ratchet tie-down strap hooked to a chain is used here to correct the kink. A length of 1/8" strap iron was used on the outer edge to distribute the chain pressure. The outer edge of Model T fenders have a rolled edge that is formed around a 10 gauge reinforcing wire. This close up shows the cracked edge and the broken reinforcing wire. With the chain holding the fender edge straight, a length of 3/16" reinforcing rod is positioned to be welded in place. The cracked sheet metal will brazed and refinished. One of the back fenders had the front and rear sections replaced. The awful looking welds were corrected. I think it will be hard to detect the splices when it is all refinished. Here the bottom sides have been sprayed with rustproofing over a brushed-on coat of POR-15. 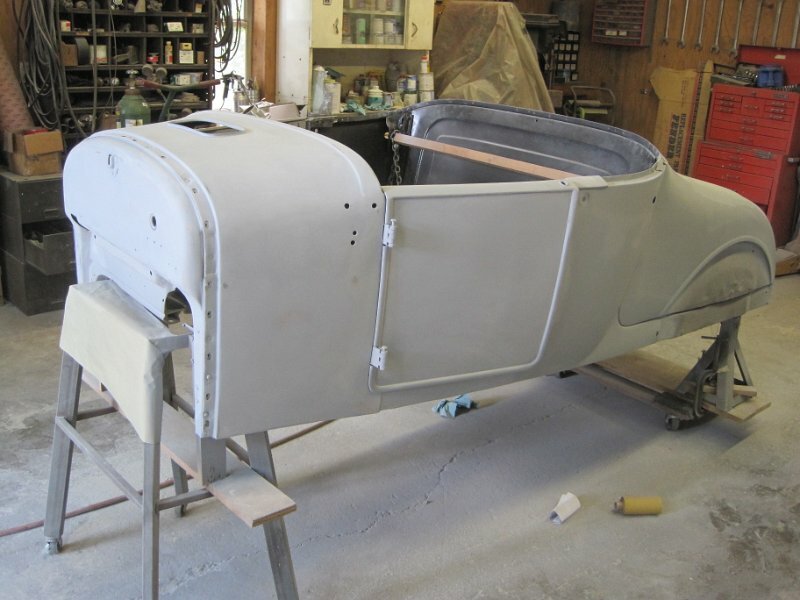 The body is moved into the shop for sandblasting and rust repair. This is the driver’s side of the cowl where the windshield stanchion was mounted. 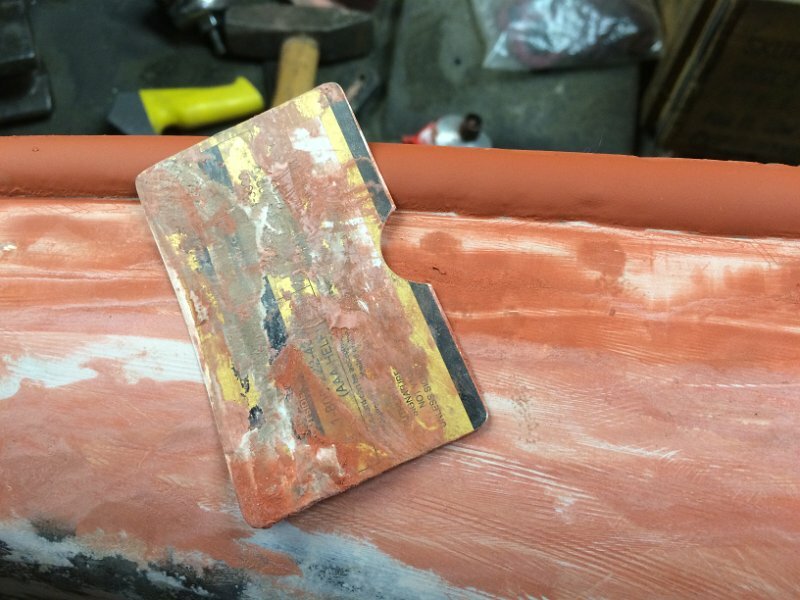 The area had been covered with about a 1/4 inch thick layer of Bondo. 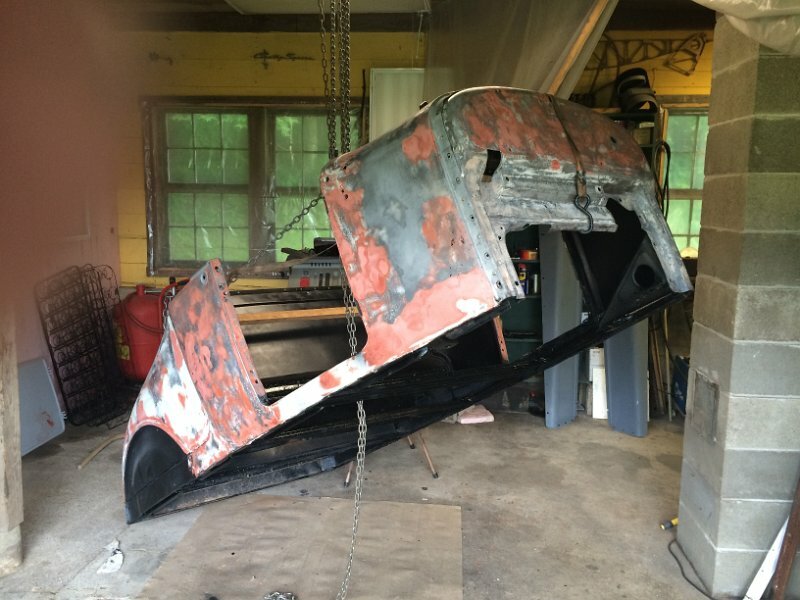 All the peripheral rust pits will be filled in with Bondo and spot putty. The rusted-thru section was removed using a cutting wheel on an angle grinder. The reinforcing doubler framework is intact. The sheet metal patch came from the salvaged cabinet of our old Kitchen Aid dishwasher. When the bonze spot welds are ground flush and the area cleaned up a thin layer of Bondo will make it look new again. New stanchion mounting bolt holes will be located from behind by the doubler . This area at the bottom of the drivers side of the cowl is also being treated with a patch. The passenger side was worse with the rusted out section running the complete length of the cowl. 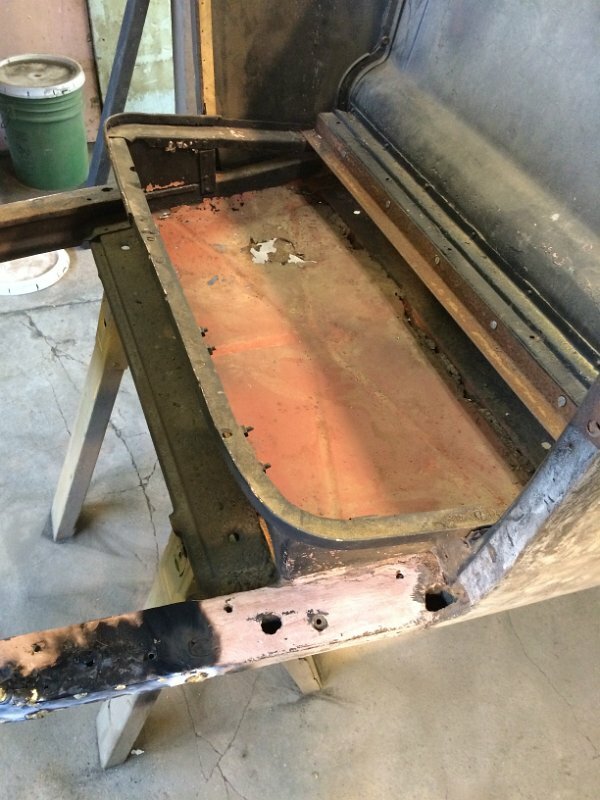 This rusted out seat pan had been covered with a sheet of thin plywood painted black. A new reproduction seat pan will replace this. More evidence of what a little moisture and 88 years will do. The area along the drivers side of the trunk opening had been rusted through but covered with fiberglas tape and a strip of galvanized flashing tin that was screwed to the underlying metal. The whole area had been filled flush with Bondo, completely covering the molding trim. Pretty ugly. A replacement strip is spot brazed and tack welded in place with the wire feed welder. The strip was cut from the salvaged cabinet from our old Kitchen Aid dishwasher. Real metal in those days before plastic dishwashers. After a thin coat of Bondo the repair will be unnoticeable. The pits in the trim molding will also be filled with Bondo and spot putty. This is the passenger side of the area along the trunk opening. It was treated the same way as on the drivers side. Spot tacks of brazing filled smaller areas of rust-through. Another patch fashioned from the dishwasher cabinet is brazed in place. This is the tool I used to fill in the pits in the trim molding. The radius was cut into the edge of the card with a die grinder. 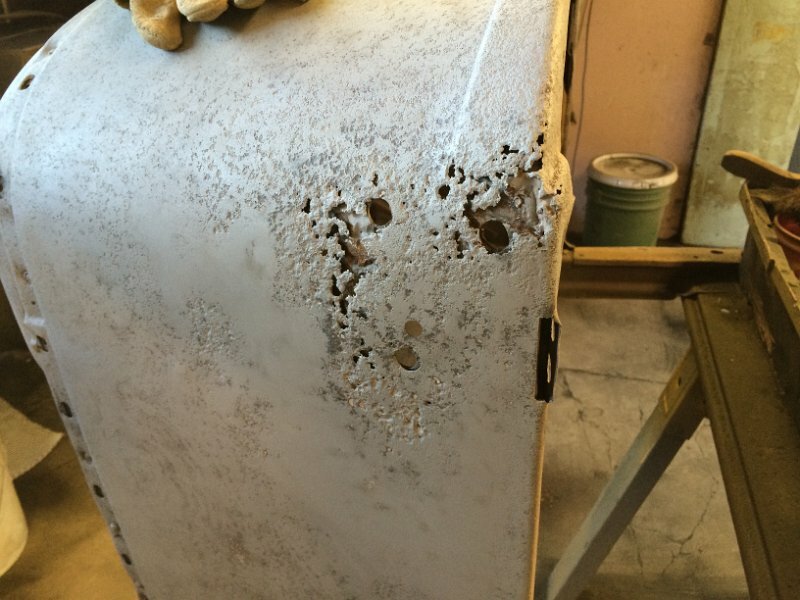 Sandblasting the passenger’s side of the trunk revealed another area laced with rusted-through pits. The area is marked for removal with a thin grinding disk on an angle grinder. The cut out section is used as a template to mark out a replacement. The replacement panel is fitted. A strong magnet helps hold the section flush and in place. Small notches were cut in the adjacent edges to allow small machine screws to be fastened to assure that the new panel was flush with the original. I neglected to take a picture of the installed machine screws. The area looked like a sharks jaws. The panel was spot welded between the machine screws. After the machine screws were removed the notches were welded over. After grinding the spot welds flush and sandblasting the welding-flash the area looks pretty good. A thin layer of Bondo will finish it off fine. Fortunately this area was flat so I did not have to worry about making a compound curve in the replacement panel. The panel below the deck lid was badly rusted and damaged so I decided to replace it with a new reproduction part. Here the panel has been slit and bent down to where it was riveted to the lower cross brace. The structure supports the spare tire carrier and was pretty badly bent up and cracked. In the factory the whole assembly was put together and installed before the rear quarter panels were installed. Looking toward the rear, this is one of the corner braces that used to contain a rubber bumper for the deck lid. The deck lid bumper support has been removed and a cardboard pattern is traced out on a 16ga. sheet. New parts have been successfully formed. Mounting bolt holes are yet to be drilled. The ends of the replacement panel fit under the edges of the trim molding and is sandwiched between the flange of the quarter panel and the trim molding flange. Included in this stack is a doubler and the ends of the cross braces. In order to fit the panel under the trim molding it was necessary to cut one side out. Not yet aware just how the thing was put together I thought I would also have to remove part of the rear quarter panel too. Now I have to do yet more spot welding. Oh well, I will now have more room to fit the panel so it might be for the best after all. The last of the framework and the rear panel have been removed. Now work on fitting the new sheet-metal panel will begin. Here is a view of the newly installed panel. The cut out section of the quarter panel and trim molding is replaced and renewed. Bondo will also fill the pits in this section of the trim molding. This is one of the replacement deck bumper supports installed. Compare it to the earlier photo. With the lower panel finished, work on the upper panel begins. Removing another thick application of Bondo uncovered more rust-through and short cuts made during the last restoration. The previous restorer apparently did not have the time, tools and equipment to do a more satisfactory repair. I decided to cut out a strip along the lower edge of the panel. This panel has a compound curvature that complicates the replacement. The panel is concave from front to back and convex from side to side, a shape that sheet metal does not naturally take. I hope this narrow strip will make this repair easier to do. The magic marker lines were warnings not to cut too close to the deck lid hinge mounts. A strip cut from new sheet metal stock is being fitted here. None of the dishwasher sections were large enough for a strip long enough for this repair. The new strip has had 1/2 inch of the upper edge “offset” so it can slip under the panel above it. The offset allows the front surfaces to be flush. The lower 1/2 inch of the edge had been bent to a sharp angle on a sheet metal brake. It was then crimped in stages to the cross member with a drill press vice. Thanks to friends that have tools to do this kind of work. Cleco fasteners and “C” clamps secured the strip for welding. Here the first coat of Bondo has been sanded down. The proper contour was maintained and has worked out pretty well. This should be the last of the necessary repairs. When all the spot putty and Bondo has been completely dried and sanded the dreaded painting will begin. The body is hoisted up and tipped back to access the body sub-frame to be painted with rust stabilizing paint POR15. 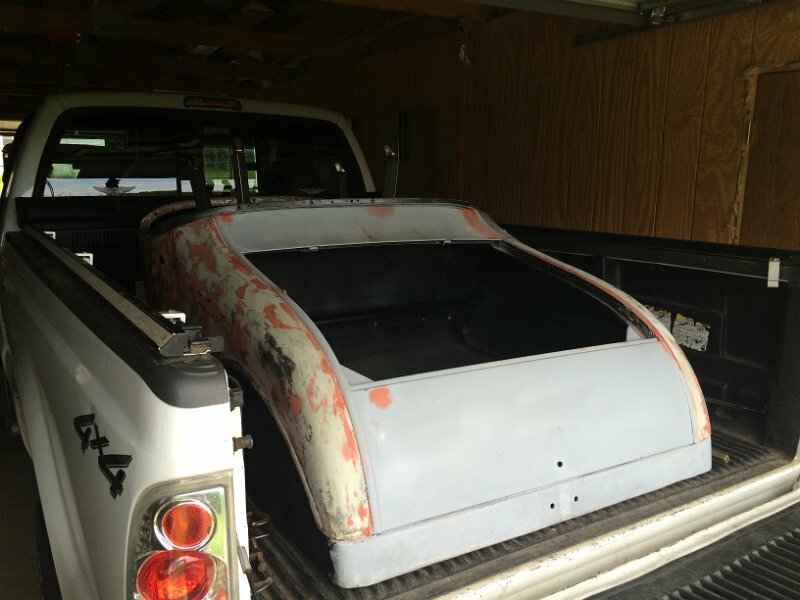 The body is loaded into the back of the pickup to be taken to body man Wayne Tanner for final finishing and painting. After more sanding and having been given a coat of primer, it is looking good. 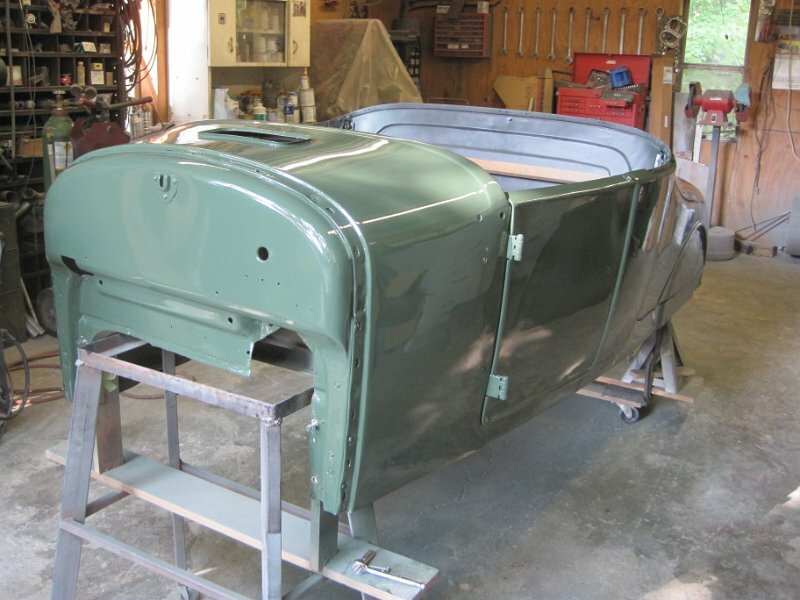 Here the body has been given its final coat of paint, authentic for the time, Brewester Green. This is the end of the body work section.